All right. That may sound a bit extreme, but you have to understand, for a couple of planners to have no precise plan is a pretty big deal. Better yet, for two planners to exhibit some flexibility in their plans, is an even bigger deal. And that is precisely what happened yesterday. Started the day off as normal. You know…the whole getting out of bed thing. 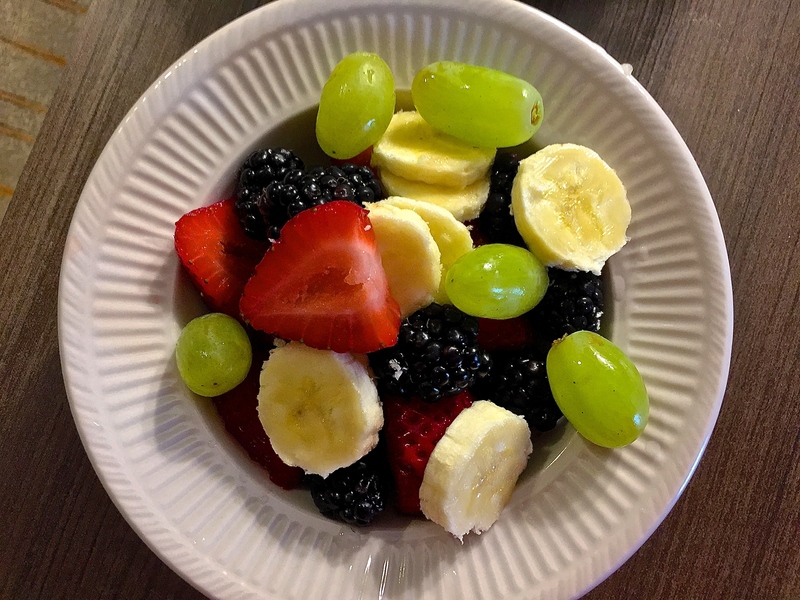 I then threw together this yummy bowl of goodness so I wouldn’t chew off my left arm waiting for our “real” breakfast. 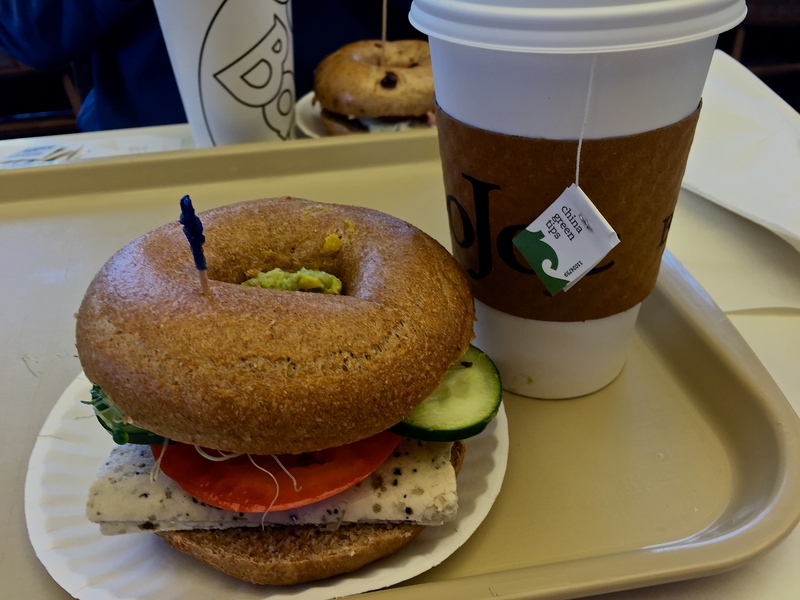 As much as we hated to admit it, we were both looking forward to round #2 of Bodo’s Bagels. So that’s just what we did. This time I had the herbed tofu with tomatoes, cucumbers, sprouts and guacamole on whole wheat. I was a bit surprised that the tofu was cold…but it was so incredibly tasty! Loved this. A lot. We had been planning on another day of hiking, HOWEVER…it was only 40 degrees and we were without appropriate hiking gear. We thought we would just wait for it to get warmer, so we killed some time in town. We stopped at the local Great Harvest because one of my favorite bloggers owns it along with her husband. It was kind of surreal shaking hands with him. We bought a bag of their special granola…C’ville Crunch! 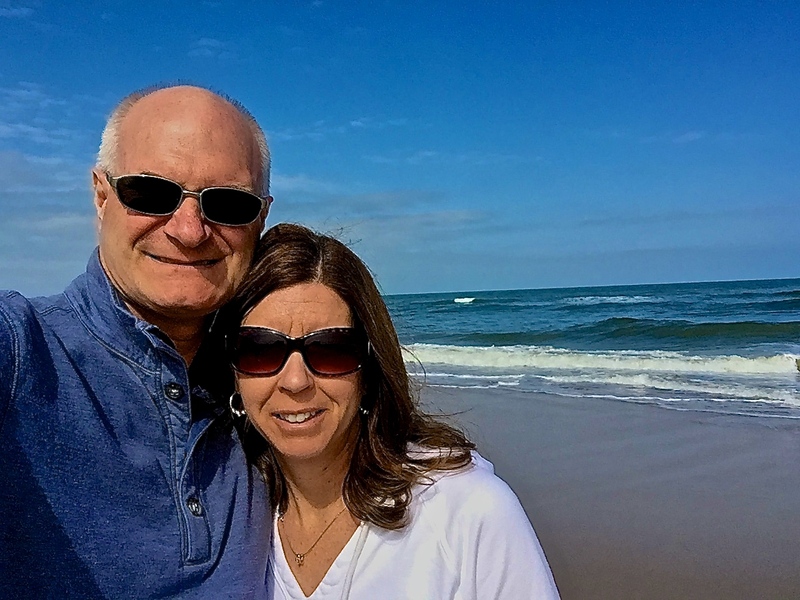 After coming to the conclusion that it was not going to get much warmer, we bailed and headed to Virginia Beach instead! The sun! And unfortunately, not much else. Apparently we were ahead of the official beach season, as we saw numerous “Closed for the Season” signs. Reed had been hoping to find some fresh seafood, but alas…it wasn’t meant to be. Fortunately, there was a Whole Foods. And thankfully, Whole Foods knows all seasons. Not just beach season. The fact that there were a bunch of fighter jets flying around, plus the fact that it was sunny and 60 degrees (making eating outside “doable” for me), more than made up for the lack of seafood. It was almost like watching Top Gun while we ate. And if you knew Reed, that is a pretty big deal. He’s a little obsessed. And, you know me. Whole Foods is my obsession, so it will come as no surprise to you that I have no complaints about my dinner. I’m in love with the kale salad dressed in tahini…plus I threw in a little sweet potato mash and some three bean salad on the side. Also had a slice of their vegan pizza of the day. Not sure what it was called…but it was good! I even ate all of the jalapeños! Dessert? Why yes…I did. Peanut butter and chocolate cupcake anyone? I ate it all by myself. The frosting was to die for. Didn’t really even need the cupcake, except for the fact that it saved me from dirtying a spoon. On the way back to Charlottesville we stopped at Colonial Williamsburg and took in the sights. I really have a greater appreciation for history now that I’m old. We arrived back in Charlottesville by 9:00 ish. An orange before bed. Sweet and very juicy. This morning we awoke to temps already in the 60’s! And rain. Lots of rain. We had been planning to hike up Humpback Mountain on our way out of town, so we tried waiting it out. Prepared another bowl of fruit. 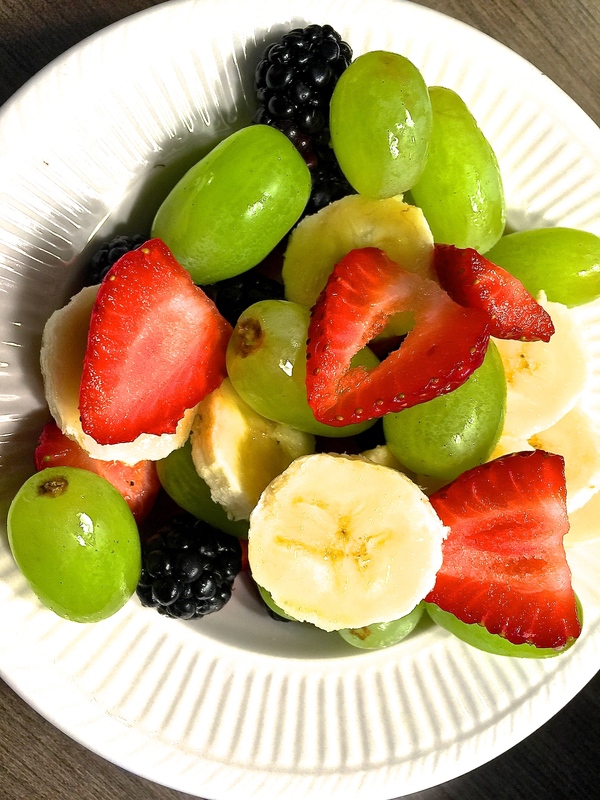 Ate bowl of fruit. Still raining. We packed up the vehicle and decided on our breakfast. I had been more than a little disappointed in the lack of vegan options for breakfast at the local restaurants. 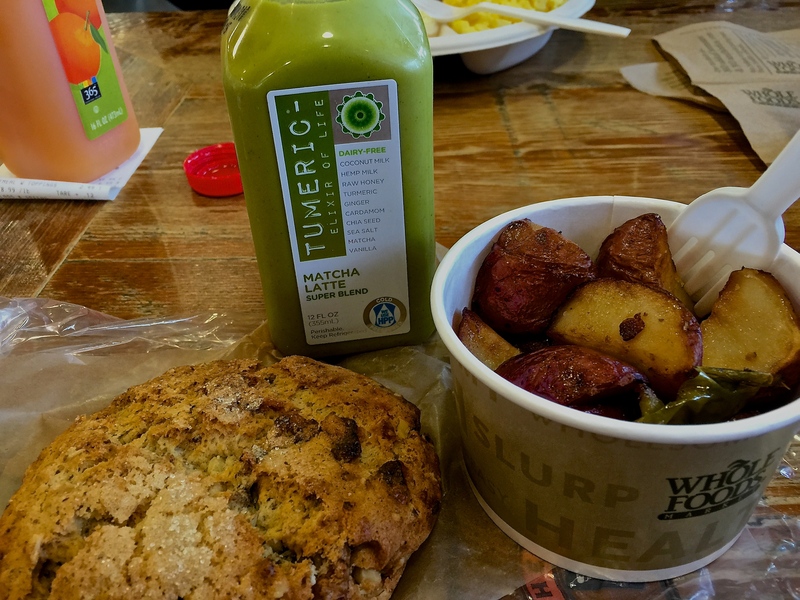 Whole Foods to the rescue! See that bottle of ugly green juice? That was the highlight of breakfast and I WILL be recreating that when we get home. Hemp milk AND turmeric? Yum! The scone (oat) and roasted potatoes were also very worthy of hanging out in my belly. Despite the fact that I’m a slow eater, the rain had still not given up. Very disappointing. So, we headed out of town, and began our trip back home. I was more than just a little bit irritated when we drove past the exit that would have taken us to Humpback Mountain. But I’m past that now. Kind of. The drive through Virginia and West Virginia was beautiful, however. I was so full from breakfast, that lunch didn’t even happen. We found a Chipotle in Lexington, Kentucky for dinner. I ordered the Karen Special. Remember…order a salad instead of a bowl and your lettuce won’t fall off. It was raining and 46 degrees in Lexington, and I was freezing. Listened to the Badger game after dinner…stressful at times, but it definitely made Indiana go faster. Why is there always road construction in Indiana? Karen – love reading about your healthy eating and this vacation. You are inspiring me to try some more healthy eating options. Also, I want you to know I tried your hummus recipe just now and it is delicious….please keep sharing!!! Thank you for the positive feedback, Elizabeth! I greatly appreciate it. And I am so glad you enjoyed the hummus!